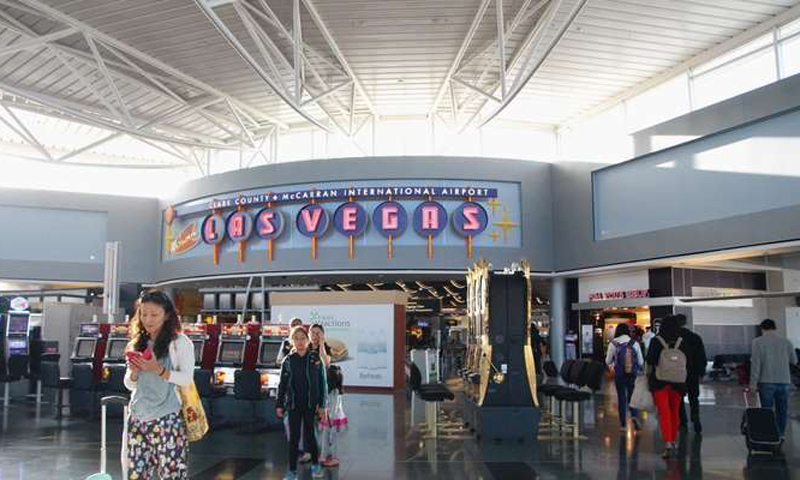 Passengers arriving at Las Vegas' McCarran International Airport. On November 7, an air traffic controller became incapacitated while on duty at McCarran International Airport in Las Vegas for an astonishing 40-minute span. The Federal Aviation Administration said that "No safety events occurred during this incident," but they and airport authorities are investigating what happened with the air traffic controller. The FAA did not identify the controller or how she became incapacitated, however, Airport director of McCarran International Airport, Rosemary Vassiliadis, issued a statement with the initial findings on Friday. Shortly before midnight on Wednesday, the air traffic controller became incapacitated. Air traffic recordings reveal airline pilots having difficulty understanding her instructions for landing and takeoff. Five inbound aircrafts remained airborne during the 40 minutes, while planes on the ground stayed in position. They began to communicate between themselves to maintain safety as they tried to figure out what the controller was saying. During the recordings, the controller sounded sleepy, apologized, and mentioned “choking a little bit.” She also mistakes an aircraft’s call numbers, and she can be heard coughing and grunting. Near the end of the recordings, the air traffic controller ignores a pilot’s inquiry. Soon after, another air traffic controller who had been on break can be heard asking if the woman is all right. Paramedics responded that evening and the air traffic controller is on administrative leave.